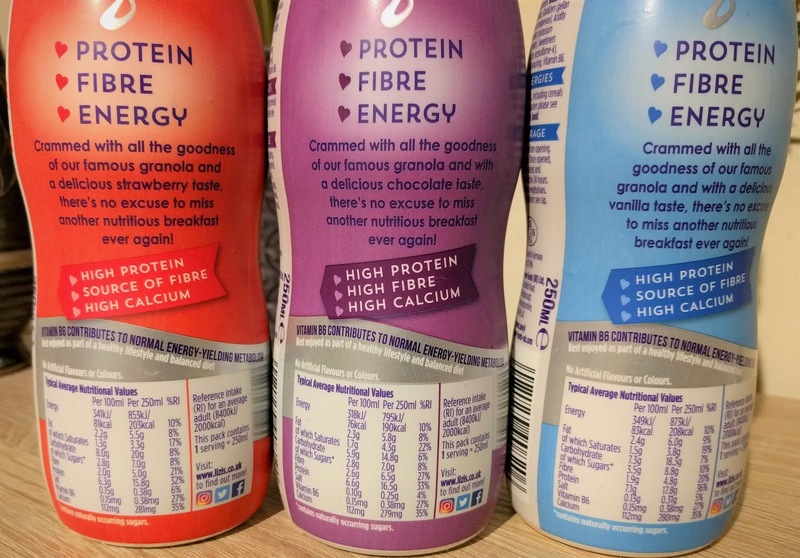 Protein drinks for breakfast is a trend that seems to be growing. They’re mainly aimed at those who don’t have time to eat breakfast before they leave home and want something portable that they can consume on the way to work or even at work. Because of their high protein content, they're also supposed to keep you feeling more full than a regular milk drink. I can’t say I’ve had much interest in breakfast drinks, but I did notice a new range on the shelves recently by granola maker, Lizi. 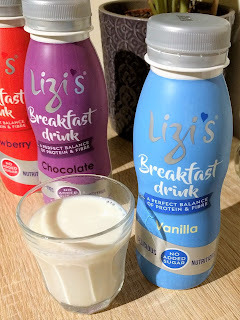 I’ve long been a fan of Lizi’s granolas – see review on Lizi’s Granolas here, and the No Added Sugar version here, so I was pleased to receive a bottle of each of Lizi’s new breakfast drinks for review. There are three flavours: Vanilla, Chocolate and Strawberry. 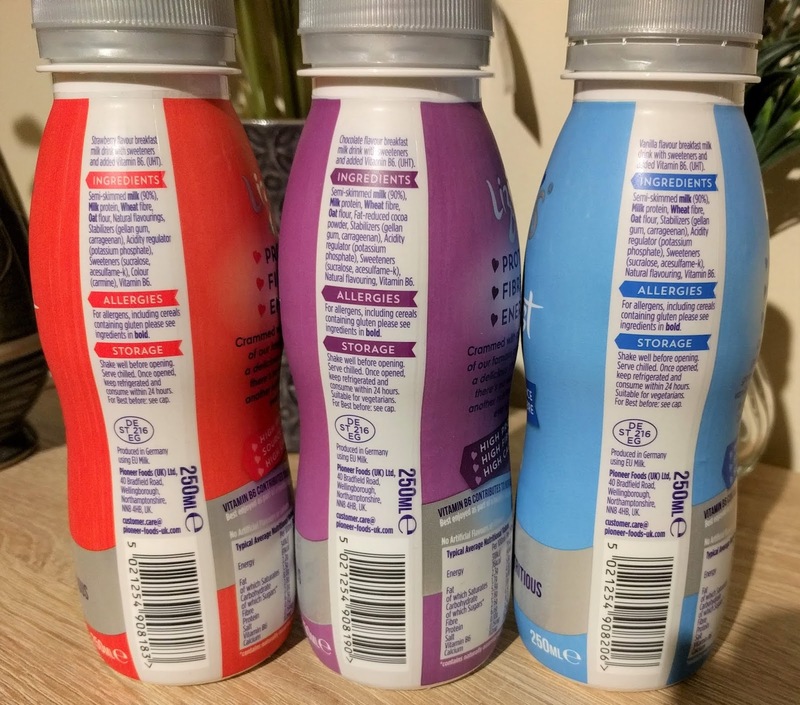 Each 250ml bottle is one serving. The vanilla has 208 calories, the chocolate has 190 calories and the strawberry has 203 calories. Best enjoyed as part of a healthy lifestyle and balanced diet. The main points to note about Lizi’s breakfast drinks are their high protein content and low sugar due to no added sugar. However, while there is no added sugar and the sugar content overall is low, the drinks do have added artificial sweeteners (Sucralose and Acesulfame-K), so this is something to keep in mind if you’d rather avoid this type of sweetener. I tried the vanilla flavour, first at room temperature and again after being refrigerated. The drink has a strong vanilla taste which I love, and it is very sweet. The milk itself is thicker than milk, a bit like a runny yogurt and completely smooth. I liked this one very much but would really find the sweetness to much to drink in the morning. I also preferred it cold from the fridge. I gave some to my daughter who said it tasted like the vanilla Petit Filous, and yes, I have to agree with her there. The chocolate was next. This one had a rich chocolatey flavour and didn’t seem quite as sweet as the vanilla, but very pleasant to drink. I gave some to hubby to taste and he said it tasted like a chocolate milkshake and liked it. The strawberry was last. Now this one I wasn’t so keen on. As soon as I took the lid off I could smell that sort of artificial strawberry smell that I’ve tasted in other flavoured milk drinks. I think because I make a lot of smoothies using real whole berries, this just couldn’t compete, so tasted too artificial. It has the same texture and consistency as the other flavours. 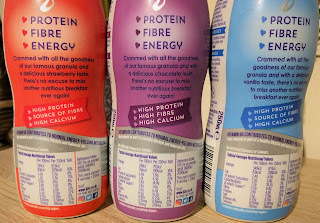 Although these drinks are fortified with extra milk protein, wheat bran and oat flour, I don’t personally see these as replacements for breakfast. However, they could be useful as a snack if you have a long time to wait until your next meal. They’re quite high in calcium and each bottle provides 20% of the recommended minimum of fibre, which goes towards helping with the fullness factor. I didn’t drink a whole bottle in one go so can’t comment on whether they left me feeling full up or not. No artificial flavours or colours, Suitable for vegetarians. The label advises to serve the drinks chilled and once opened they should be consumed within 24 hours. 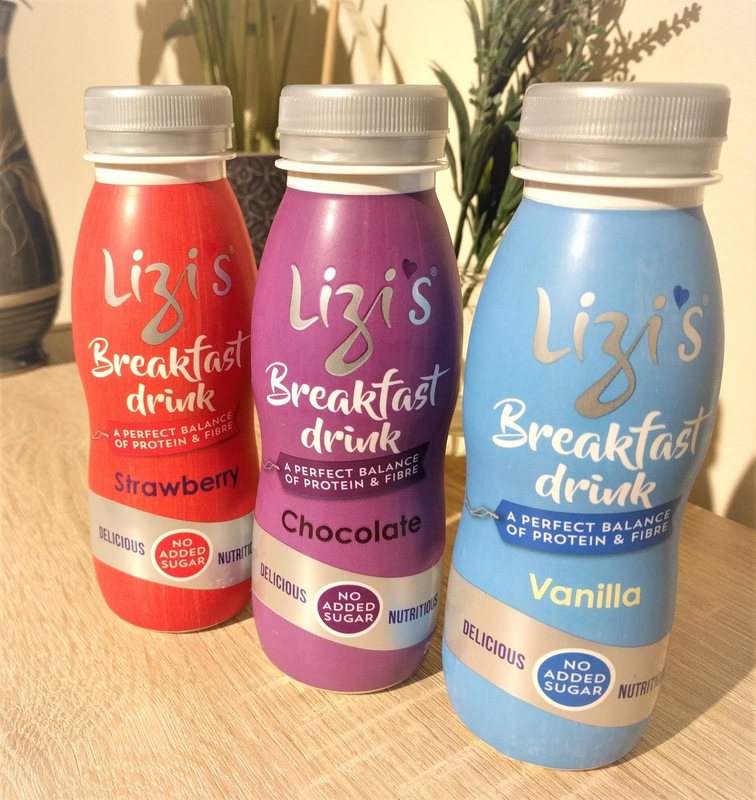 Lizi’s Breakfast Drink’s recommended retail price is £1.49 for a 250ml bottle and is available in Sainsbury’s and Ocado online. 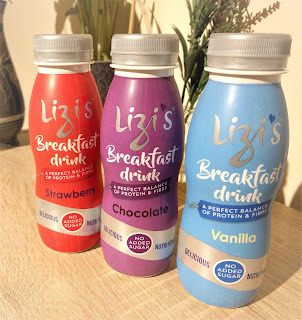 Overall, I’d say if you like drinking flavoured milk, then this Lizi’s is possibly a better one to go for due to the low sugar and high protein content. 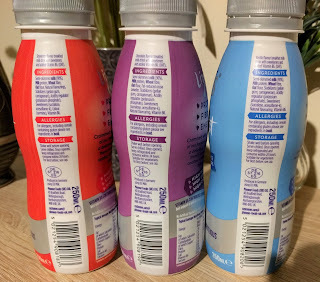 But if you’re wanting to avoid artificial sweeteners, this drink has both sucralose and Acesulfame-K.
83 Calories, 2.4g fat, 1.5g saturated fat, 7.3g carbs, 3.5g sugars, 1.9g fibre, 7.1g protein, 0.13g salt. 76 Calories, 2.3g fat, 2.8g saturated fat, 5.9g carbs, 2.8g sugars, 2.6g fibre, 6.6g protein, 0.10g salt. 81 Calories, 2.2g fat, 1.3g saturated fat, 8.0g carbs, 2.8g sugars, 2.0g fibre, 6.3g protein, 0.15g salt.